The precise calculation of the balance of the wing in flight is one of the priorities of the designer of paragliders. This chapter details the calculation of the balance from a two-dimensional analysis. It also provides a simplified method and even empirical type. 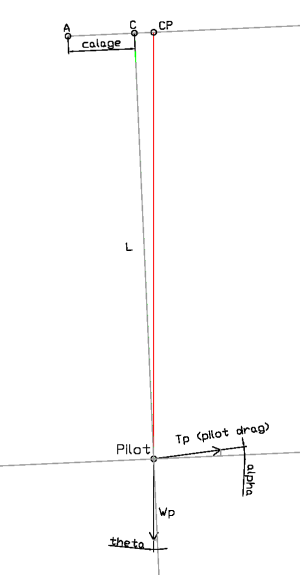 The longitudinal study of 2D equilibrium in a paragliding, developed from the attached drawing. The method is based in references  and , using the same notations. Fig. 1: Longitudinal equilibrium (click to enlarge). Forces, points, angles, and lengths involved. Vector represent bold. Understanding each of these elements is important to understand the balance of paragliding. The paraglider is represented at a central profile representative of all the profiles of the wing. The geometry and aerodynamic properties of this profile represent the whole wing with sufficient accuracy, which is simplifying the model. Forces P, T, amd momentum M, was the resultant of erodynamic forces acting on the profile, and applied in the center of pressure Cp. The values of aerodynamic coefficients Cz, Cx, Cm corresponding to different angles of attack α can be obtained through numerical models (program XFOIL). Forces Ts and Tp depend on the lines scheme (diameters, lengths, pads) and the position of the pilot and his harness. Wp and Wa apply in the centers of mass of the pilot and the wing to form a single center of mass, which should be balanced in flight under the cebter of pressure Cp of wing. 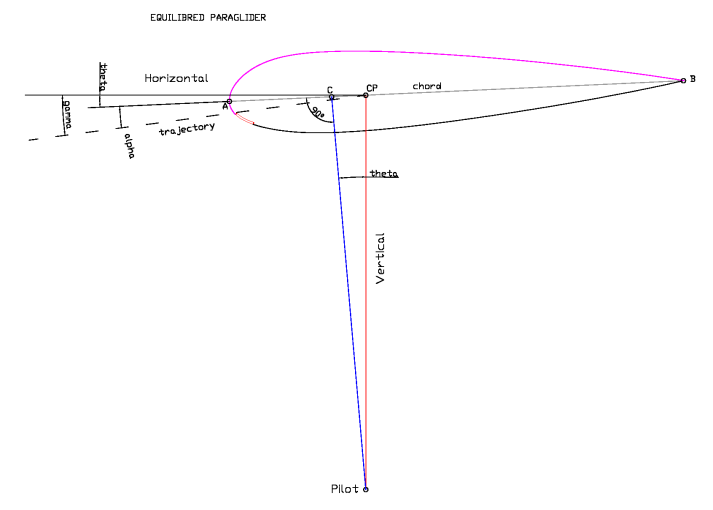 The calage point C, is an arbitrarily point defined by drawing a line perpendicular to the chord profile from the pilot position P. The AC distance is very important because it defines the relative lengths of lines and the behavior of the paraglider. Our main goal is to find the most appropriate calage. The foyer point F. The foyer of not intervening directly in the calculations of balance, but their knowledge is important to know the stable or unstable profile chosen. Its definition is not simple, and can be performed as follows: The point of the chord from the moment produced by the coeficient of lift (Cz) balances (equal and opposite sign) the aerodynamic moment Cm. That is, the distance between the foyer F and the center of pressure Cp, multiplied by the coefficient of lift Cz is equal to Cm. For practical purposes it is enough to know that the foyer is located at 25% of the chord from LE in most profiles. 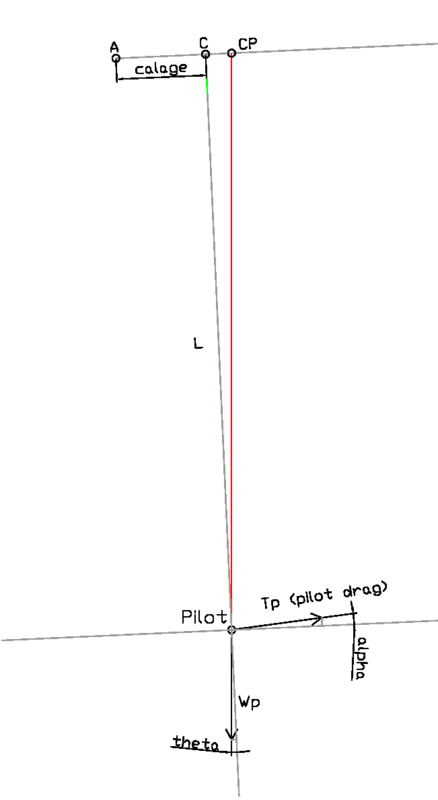 The angle of glide γ is the angle between the horizontal line and flight path. 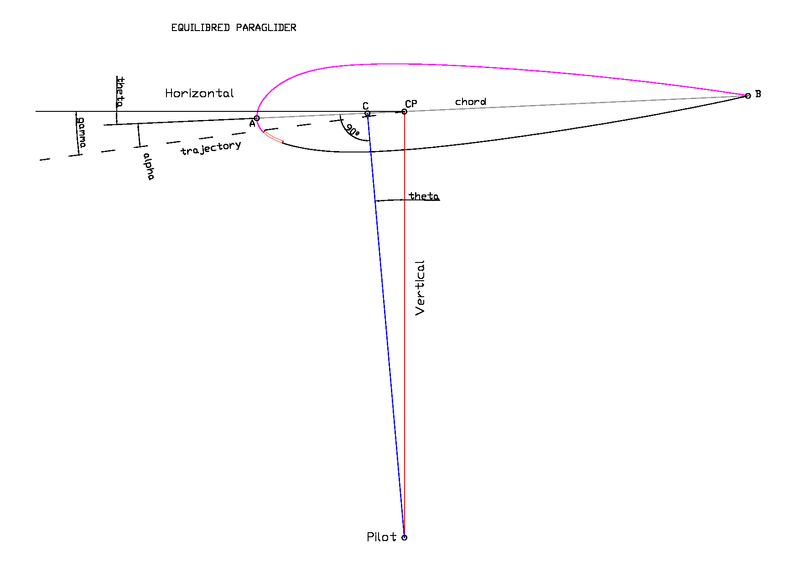 The angle θ is angle between the horizon and the airfoil chord. The angle α is the angle of atack (AoA) formed between the chord and the trajectory of the wing. Σ M = 0 The sum of moments from a point is equal to zero. Σ V = 0 The sum of vertical forces is zero. Σ H = 0 The sum of horizontal forces is zero. 2.1 Sum of moments from a point is equal to zero. q0 = (1/2) * ρ * S * V2 was the dynamic pressure, where ρ is the density of air, S the area of the wing, and V the velocity. 2.2 Sum of vertical forces is zero. Positive in the direction of gravity. 2.3 Sum of horizontal forces is zero. The solution of the system can be obtained by analytical or by numerical method. We use the numerical iterative way, based on the balance equation of moments to get their sum equal to zero. 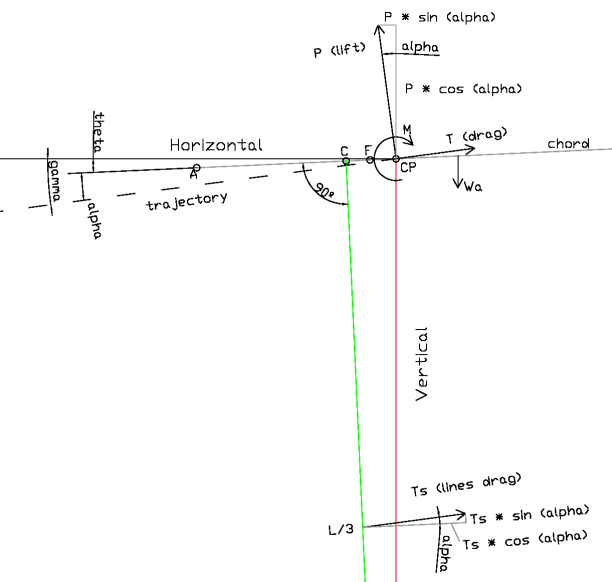 The objective is to obtain a combination of parameters to meet the equations and provide the desired angle of glide. Note: The spreadsheet is still in development (there are some details to be corrected). When functional the file was posted in .ods .xls format for download. 1. We draw the central wing profile in the planned equilibred flight. 3. We assume that the airfoil incidence corresponding to max glide ratio or slightly higher (10%), is α. Depending on the profile of the whole wing, usually those angles ranging between 5 deg and 10 deg. 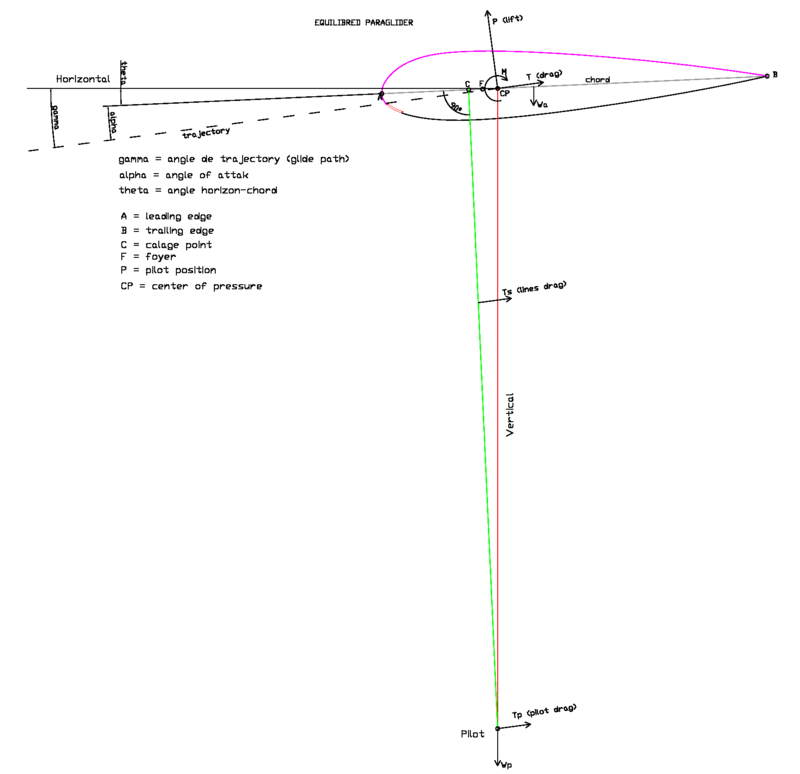 It is preferable to a plan to estimate the glide at the highest speed, so we start by estimating the angle at 5 deg. 5. 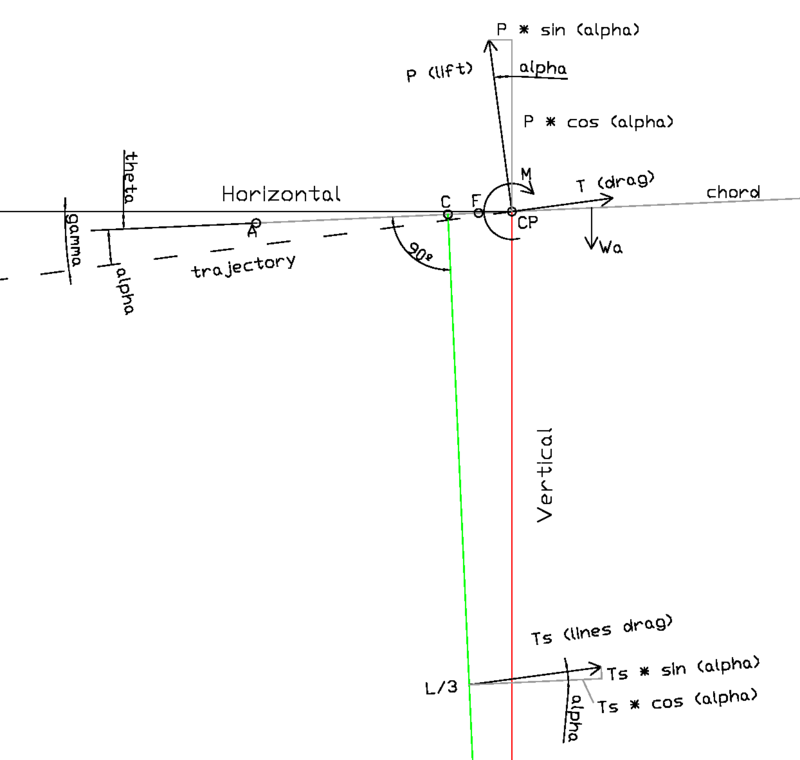 We locate the position of center of pressure Cp for the chosen profile and angle of incidence α. 6. We locate the position of the pilot P in the same vertical of the center of pressure Cp, at a distance equal to the lines length. 7. From the pilote point P draw a perpendicular to the line of chord wing to determine the calage C of the wing. The method is simple and can be used for a first approximation. But has the disadvantage of having to estimate a priori the glide angle (deductible by the general characteristics of the wing) and the angle of attak at maximum glide ratio (more difficult to estimate). Some corrections on the length of the riser or lines in the prototype are necessary to determine the calage just ideal. Many designers use empirical methods based on their experiences with previous models. These methods are simple and effective. 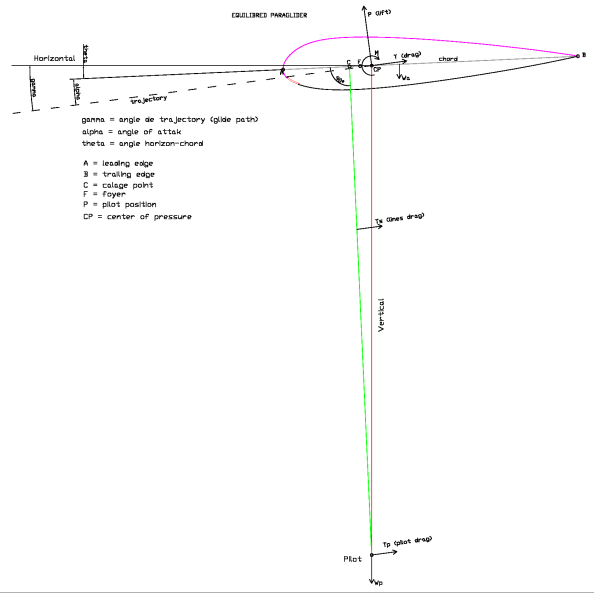 A very effective method is to study the profile and the relative length of the lines of a existing paraglider with similar characteristics to the project. We only need to study the middle section and deduct graphically the calage employee, with and without speed system.